PT Kimia Farma (Persero) Tbk - Kimia Farma is a reputable state-owned company in Indonesia, based in Jakarta and running business in the field of integrated pharmaceutical industry. Its business include pharmaceutical manufacturing industry, pharmaceutical trade and distribution, retail pharmacy, health clinic, laboratories and optical clinics. As a state-owned company, Kimia Farma is controlled by the Government of Indonesia. At present, PT Kimia Farma (Persero) Tbk - listed on the Indonesia Stock Exchange (IDX) under stock code KAEF - is 90.025% owned by the Government of Indonesia, 0.152% by management/employee and other remaining shares was owned by public. 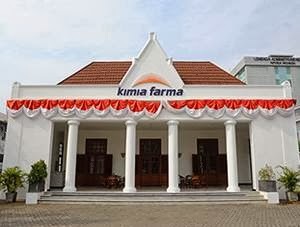 Kimia Farma now has 5 pharmaceutical factories; Jakarta, Bandung, Semarang, Watudakon Jombang and Tanjung Morawa Medan. Kimia Farma also supported by 1 research and development office at Bandung and 1 central logistic unit Jakarta. Kimia Farma has 6 directly-owned subsidiary and affiliated companies, namely PT Kimia Farma Trading & Distribution, PT Kimia Farma Apotek, PT Sinkona Indonesia Lestari, PT Kimia Farma Diagnostik, PT Kimia Farma Sungwun Pharmacopia and PT Asuransi InHealth Indonesia. According to PT Kimia Farma (Persero) Tbk Annual Report 2016 as quoted by JobsCDC.com, Kimia Farma managed to recorded good performance in the business year of 2016. Kimia Farma managed to record a total sales of Rp 5,811.50 billion in 2016 or growth by 19.57% from Rp 4,680.37 billion in 2015. Referring to its annual report, Kimia Farma recorded a growth of 13.24% in total operating income in 2016 amounted to Rp 442.82 billion over the previous year of Rp 391.04 billion. Background in Dokter Sp KK/GD. Aesthetic. Minimum 1 year of experience in beauty clinic. Preferably have experienced in beauty clinic. Background in Diploma Degree (D3) Pharmaceutical. Background in Senior High School or equivalent (SMA/SMK). Have minimum 1 year of experience, preferably in beauty clinic. Have a good communication skill and friendly. JobsCDC.com now available on android device. Download now on Google Play here. Please be aware of recruitment fraud. The entire stage of this selection process is free of charge. PT Kimia Farma (Persero) Tbk - SMA, SMK, D3, S1 Fresh Graduate, Experienced Kimia Farma July 2017 will never ask for fees or upfront payments for any purposes during the recruitment process such as transportation and accommodation.